Why is this so popular? Three reasons, I think. The least of them is probably that this is an almost unprecedented number of ducklings tended by one hen. The other reasons are anthropomorphic: we see a huge number of cute baby ducks following mom in a neat line, and we emphathize with a mother who tends all those babies. A minor reason may be because the layperson has a scientific curiosity about how this can happen. But what do I know; I’m just an average Joe who does genetics. Where she goes, they follow. All 76 of them. It’s not unusual to see many ducklings gathered together. Some 20 or 30 have been reported with a single hen. But 70-plus? MAMA MERGANSER! I was able to track down the now famous Lake Bemidji Common Merganser that has an adopted brood of over 76 babies! I love the story that these photos tell. The females at Lake Bemidji, many of which are related, lay eggs that hatch around the same time, he said. Afterward, he said, the adult ducks go off to molt their feathers, leaving their broods in the care of a matriarchal female. “She’d be kind of like the great-grandmother,” Mr. Rave said. Mr. Cizek, the photographer, has gone back to the lake several times to photograph the ducklings as they grow. He said he had seen other adult ducks around the brood, but when Mama swims away, the ducklings follow her. Now that of course is not necessarily an explanation, for we want to know why this female duck tends so many young. After all, if none of them are her offspring, she has nothing to lose by flying off—unless they contain some of her genes, as suggested by the fact that some of the mothers are related, and may be related to “SuperMom”. We could test that by seeing if this kind of phenomenon is more common in lakes where females are more related. Alternatively, it’s her brood in there, too, and she simply has no way of cutting out the others, while other ducks have everything to gain by parasitizing the care of another female. I’ll write Bruce Lyon, our Official Website Ornithologist™, to get his take on this. This entry was written by whyevolutionistrue and posted on July 29, 2018 at 10:15 am and filed under animal behavior, birds, ducklings, ducks. Bookmark the permalink. Follow any comments here with the RSS feed for this post. Both comments and trackbacks are currently closed. If the class size is this large it’s better for the curve right? If the purpose is protection, one wonders how supermom could protect all these ducklings, particularly the ones at the end of the line. Protection would presumably derive from schooling, not necessarily the immediate behavior of the one adult. Yeah, it’s safety in numbers with an adult around to supervise the miscreants, it seems. Dr PCCE brings up a good question – why? 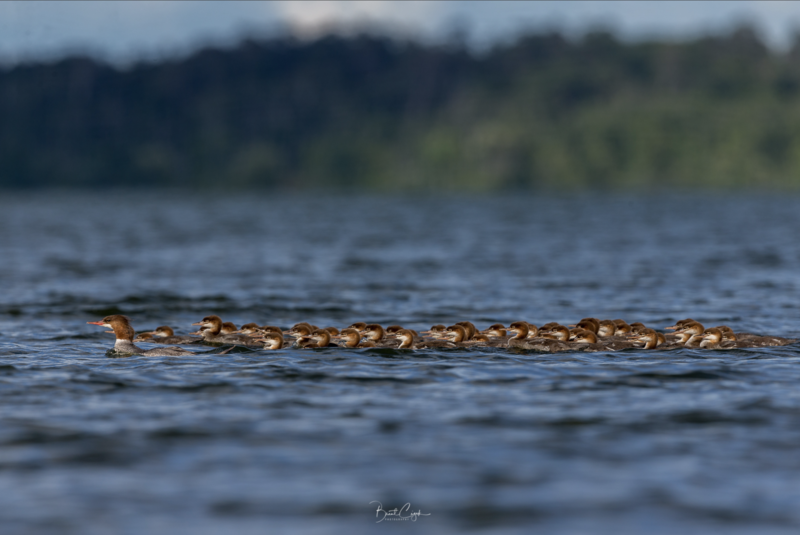 Maybe they can’t distinguish their own chicks (this is how Cowbirds and other brood parasites get away with their reproductive strategy) but it seems unlikely the mom duck would be so confused about how many ducklings she has that she’d think her brood was 76 chicks. Actually, a number of birds respond positively to “extra” stimuli, like an egg model that’s too big even to sit on comfortably. They’ll pick the big one over their own every time. So I doubt we can assume that being able to count (even if ducks can) would prevent the hen from sticking around all these ducklings. If Honey had anywhere near that many ducklings in her charge, just think what your food bill would be, and you’d have to hire helpers. Yeah, I’ve already calculated that, as of today, it’s about $35/duckling. I will weigh in here because I have worked on adoption with John Eadie in Barrow’s Goldeneyes in British Columbia. Eadie wrote the foundational paper on adoption in waterfowl (Canadian Journal of Zoology 1988) where he outlined the various hypotheses that could explain adoption. I posted some of this same information in a comment a few weeks back when Jerry included just a photograph of the merganser. Goldeneye ducks are great for studying adoption because a given lake often has only several females and individual females and ducklings can be followed. The ducklings have nice white cheek patches which can be marked with colored permanent markers. Each nesting female gets her own brood color (same cheek same color for whole brood; e.g. blue left cheek). When ducklings are adopted it is then possible to know which brood (and mom) the duckling originally came from. We had one female we dubbed Supermom adopted who had chicks from five different females and she had something like 30 or 40 ducklings. Her brood was colorful like a Christmas tree. At least a couple of different explanations might account for the adoption in waterfowl: there is safety in numbers so females are happy to adopt kids from other broods or adoption is a form of post-hatching brood parasitism where the biological mother of the adopted ducklings benefits by fobbing her chicks off on someone else. Depending on whether adoption is costly for the foster mom, she might be neutral or against it. If chick recognition is not possible, there might also be nothing she can do about it. In Canada Geese, there are studies of kidnapping of young—apparently having additional goslings is so good that the adults appear to kidnap each other’s chicks. At least that is what is claimed. For goldeneyes, my colleague Eadie was pretty sure at the start of the study that adoption is beneficial to all. However, we did brood size manipulations and found that there was no cost or benefit to adoption. The females that gave up their ducklings were females with smaller than average broods—we argued that these small brood would yield small payoffs for the females, that the costs of staying exceeded the benefits given that they could find a foster mom. For goldeneyes, it seems that the brood desertion maybe what drives adoption. These females seemed to take their brood over to another female, who would fight with the intruder and chase her off. The ducklings then insinuate themselves into the brood and, voila, adoption is achieved. As to whether foster moms can distinguish their own ducklings from the foreign ducklings, we did some duckling addition experiments to see if moms would happily adopt kids and the will as long as the introduced ducklings were the same age as their own. When we tried to introduce smaller ducklings into broods of older ducklings the moms would invariably attack the ducklings and try to kill them (we rescued all of these experimental ducklings and got them safely into broods of the same age). This observation suggests that adoption may not always be beneficial to the host. Re the composition of the merganser mega-broods vis-à-vis those of the goldeneye, I don’t have the citation handy, but I read that they can be composed of individuals of varying ages and sizes, so the merganser mum doesn’t seem to mind that. I forgot one potentially important detail that Jerry touched on, relatedness. Waterfowl are unusual among birds in having the female return to her birth site when she grows up; typically males do this in other birds. This means that females in social neighborhoods are often related. There has been a lot of interest in determining whether kinship explains brood parasitism in waterfowl, since parasitism within species is rampant in waterfowl. There is evidence that kinship can sometimes be important but it is often not the major explanation. Adoption is often seen as a post-hatching form of brood parasitism with many of the same hypotheses for parasitism applying to adoption. Kinship could certainly play a role but my sense is that this is not the only thing going on. Even if they are brood parasites? Everyone loves a parade and considering how crappy tv coverage is of the Thanksgiving & New Year’s ones this is especially good.